any idea on how to improve this?. Used luascipt+meshlab+assimp+metaseqia. Am only a n00b once its related to 3d artwork. any good forums in the net? Its not related to skinning so i placed it in anything else. sry for not typing more hope post is successful this time. Wanted to let you know I looked at this post. Sorry but I know nothing about making 3D. If I did I would try and help you. Thx Destrohelix, any good tips for blender.? Did now looked in metasequia3d and there really was a merge close points options, now i can also sculpt ( draw inflate flatten smooth) on the edges! Blender doesn`t load it with colors , its a normal binary ply file. So i try using metasequia for the shape/object and meshlab for the colors until i find a better solution. (metaseq4 also shows vertex color ). Did you save the file to obj and load to blender? They are many tutorials you can watch like in youtube its really takes time before you learn. Hi, post in a week again here how far ive progressed. Please no youtube videos they are bad for my internet connection. 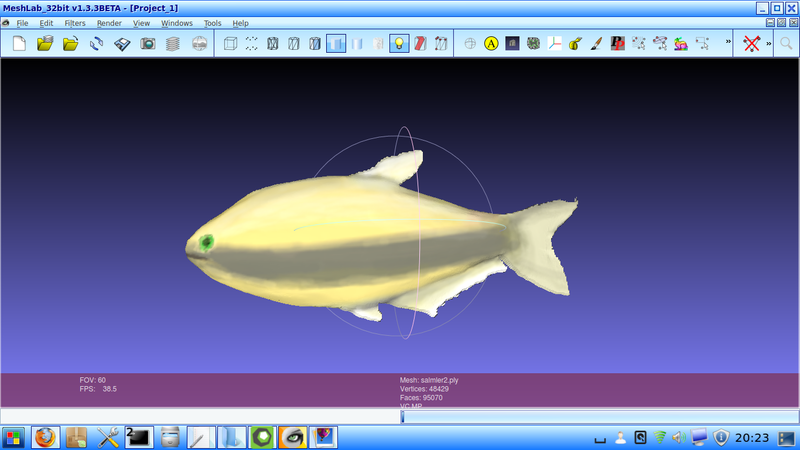 Depending on what kind of fish your creating sculpting i would say its mssing a lot of depth. I also see that you have quite some verticles and faces for this model. I did the same thing when i started a tip that will make the work far more easy in the end, is to start low stay low until the main shape of the model is done then subdivide remesh/retopo and start adding more detail on a clean surface that is evenly spaced. Also as Destrohelix mentioned tutorials can be very helpfull. Blender is free but powerfull, only the userinterface is hard to understand - that is the reason why i never used it much. But if you want to save money, and if your`e interested to get into 3D, blender is probably worth learning. I started using ZBrush when i had my first Job and learned rather quickly since its very natural at least i think it is. Also sold couple of models including stuff for DAZ 3D shop that some use. However im currently studying and have therefore only little time. I have a topic here on Wincustomize if you are interested i will send you a link. Something like that: http://www.cse.wustl.edu/~taoju/code/polymender.htm ? Just a tool i found on the net that works with ply and schould do the thing for non commercial learning purposes too. Do now how to reduce polygon size . As you can see, most of it was generated by the third picture as base. Yes if you have a small list you can send me in a pm or here without to much effort i`ll be glad to look at it. Prefer no videos . uartsy.com seems great, except the fact that sculptris is awesome ( only my opinion). Look at it soon. Some tips there are really great even if you do not use zbrush or sculptris. Just something to explain, what ive doen so far. A Nematobrycon palmeri / emperor tetra is what i want to draw they are thin and only 5 cm long and a bit more flat than a neon would be. Uhm... Polymender is something else it will repair the model as far as i read, it will close holes of the model and soften sharp edges but not rearange the faces. NVM my last comment about retopo it will get to confusing for now. still can get into that once your happy with the model and if you want to know about it. add modifier -> remesh octree dep 6 or 7 mode block ( not smooth) in blender is really close to polymender ( except the fact polymender also tries to repair te mesh). some advices ? did now sucessfully reduced polycount for one mesh and one only the half in higher res.